Marlborough-based artist Clarry Neame describes himself as an impressionist painter of light. He believes that when you are surrounded by nature's best that's lit with the region's superb clarity of light, you cannot do or be otherwise. Rebeka Codlin is a young, self-taught artist from the Marlborough Sounds. Drawing and painting has always been a passion, although she never took art as a subject at school, preferring to develop her style through her own experimentation. Graphic montage artwork by Picton Marlborough New Zealand based artist.Online gallery. Fran Maguire is an artist who works predominantly in clay. Her work reflects the Marlborough environment and documents her personal experiences of being. She makes both sculptural and domestic pieces. "There is an earthy connection to a deep old knowing in working with clay which continues to intrigue me." 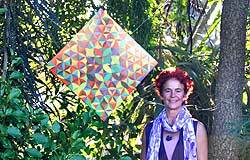 Ruth Stirnimann is an internationally exhibiting New Zealand artist who paints in two juxtaposing styles, each complementing the other like yin and yang: flowing, informal abstract paintings and geometric works. "I love to go beyond the known, making intangible vibration tangible in my works." Rick Edmonds' compelling paintings on gesso panel depict the transient and fleeting nature of the sea. A lifelong yachtsman along the coast of New Zealand’s Marlborough Sounds, his works portray the impact of light on water and the artist’s presence in the wake of his vessel, which Edmonds terms his 'signature upon the sea'. Few painters have welded nature and and the human spirit as well as Brian Badcock.Brian has earned national and international success for his richly coloured canvases that capture the essence of his New Zealand environment.A visit to his gallery at 22 Leitrim Street,Blenheim will be a highlight of your visit to Blenheim. Bruce Fergus, a creative professional in art works, painting, woodart for interior and exterior sculptures. Chris Cockitt is an Artist known both nationally and internationally for her pastel portraits of animals, birds and pets. Also commission landscapes in oil paint. Chris works from her home gallery, Petpix Studio, 12A Battys Road, Springlands, Blenheim. Over the past 35 years, Brian Baxter has established himself as one of New Zealand's most sought after artists in the field of landscape, still life and flower paintings. Artist Karen Neal is commited to supporting animal and conservation causes through her art. Five percent of pet painting commission sales is donated to the HUHANZ; 5% of commissioned wildlife paintings to a wildlife or conservation group and 10% of calendar sales is donated to SPCA. Kim Gabara creates sculptures made from a variety of flotsam, jetsam and cast-offs - including wood, steel, copper, canvas and wire. His paintings are done in acrylics.